"... I´m also very impressed with the quality of your refill. I have been using samples since 1990 and have many refills nowadays. But your samples, including Revolver, just got up to my top list when doing music. I really don´t know any other Refill with analog synths that sounds like this - even compared to my old Akai library or crappy NI collections - which sound more digital than a badly TB-303 replica. I couldn´t detect any looping clicking noises. I always look for these and find them everywhere. I found none and that tells me a lot about how much work went in there and I have not even scratched the surface of the work that you invested in order to let them sound so "clean" / "raw" and warm. No, really. Very good quality samples and work on the patches. All are instantly playable for me. As an outsider to the creation of the refill - let me tell you this: EXCELLENT JOB, SIR! In my opinion this refill (AM3) for that price is an absolute smash-hit, must-have for every serious Reason user." Like: I like the quality of this big refill ! The sound is perfect as the NNXT patches... This is really a must have ! The Waldorf Microwave, Korg MS-20, Roland Jupiter 4 and Juno-60 were all popular synthesizers back in their day. And along with the Moog Prodigy, Korg Poly800 Mk11and the Korg MonoPoly, they are now collectable instruments the world over. The chances of finding even just a few of these analogue dinosaurs in good condition are slim. But all is not lost because the Pink Noise team have sampled the best sounds from all seven along with two more recent analogue favourites, the Alesis Andromeda A6 and the Studio Electronics SE-1X, and made them available as Reason Refills. We were very impressed with the original Analogue Monsters collection when we first reviewed it in 2005 but since then Pink Noise have completely rewritten and enlarged the patch banks as well as adding new NN-XT and Combinator banks. They’ve also added samples from another 1980s classic, the Oberheim Matrix, which brings the complete ‘monster’ tally to ten. Noted for its warm sounds this legendary instrument was the last true analogue synthesizer made by Oberheim. 5GBs of content amounts to a significant number of synthesizer patches – apart from the 72 Rex files – but in this case the quantity doesn’t compromise the quality. Our only reservation is that, inevitably, with ten analogue synthesizers in a single collection, many of the patches, although not duplicated, do sound similar. This isn’t a criticism, though, more an observation and for such a reasonable price, true analogue buffs are sure to be delighted with their purchase. Verdict: An impressive, value-for-money Reason Refill containing samples and patches from 10 legendary analogue synthesisers. Amazona.de is the biggest magazine for music and computers worldwide in German language. 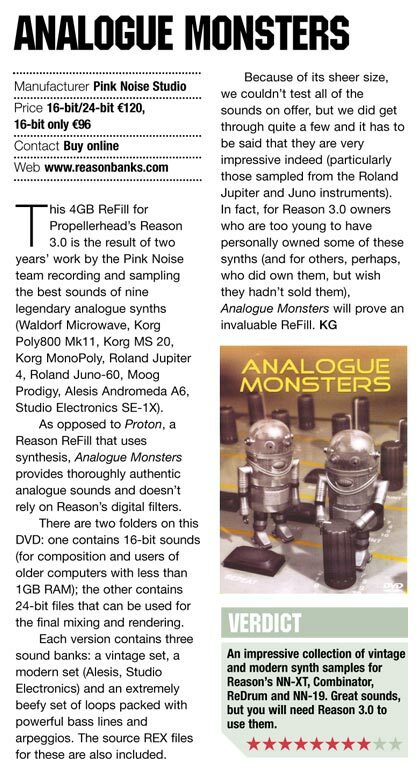 Björn Morgenstern has written a very detailed and deep review about our much-loved Analogue Monsters. German readers, you can read he full review here! "I think it's a really huge library with a good quality. The sound is great analog, nevertheless suitable for any music-style. That's a good point, because libraries often focused on special music-styles, where are only parts usable for the customer. There are no needless breakfillers for me and I think there are many creative potential in this library for future programming. Mostly patches are even for low RAM and CPU, so you can use it on any Computer and loading is mostly fast. The idea to offer the sampledata out of the refill is fine, because Reason users often have lot of refills and don't use all stuff in it. So you can pick up the sounds you want and make your own personal refills or you can save your songs within all the sampledata, or you can use the sounds in a different sampler. Price of the Library is very fair and there is no really disadvantage. Only one thing perhaps to do, you had already write it to me, making some more patches / combinators with this huge raw-data. Perhaps with some more Effect-combinator devices in Vintage-Analog-Style (like the nice string-machine Ensemble effect in the refill of Robert Sigmuntowski or some Vintage Sound phasers, delays and so on). However, I wrote in the review that you will bring up some more combinator-patches in future, somewhere this year."